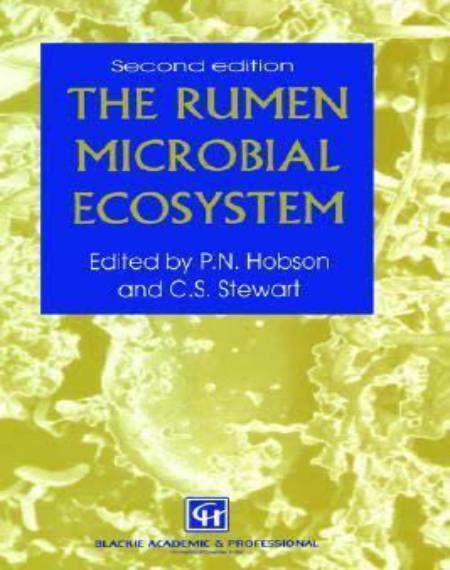 The Rumen Microbial Ecosystem.The Preface to the first edition of this book explained the reasons for the publication of a comprehensive text on the rumen and rumen microbes in 1988. The microbes of the ruminant’s forestomach and those in related organs in other animals and birds provide the means by which herbivorous animals can digest and obtain nutriment from vegetation. In turn, humans have relied, and still do rely, on herbivores for much of their food, clothing and motive power. Herbivores also form the food of carnivorous animals and birds in the wild. The importance of the rumen microorganisms is thus apparent. But, while a knowledge of rumen organisms is not strictly necessary for the normal, practical feeding of farm animals, in recent years there has been much more emphasis on increasing the productivity of domesticated animals and in rearing farm animals on unusual feed stuffs. Here, a knowledge of the reactions of the rumen flora, and the limits to these reactions, can be invaluable. In addition, anaerobic rumen-type microorganisms are found in the intestines of omnivores, including humans, and can be implicated in diseases of humans and animals. They are also found in soils and natural waters, where they play a part in causing pollution and also in reducing it, while the same organisms confined in artificial systems are essential for the purification of sewage and other polluting and toxic wastes. Similar organisms are now being found in volcanic pools and thermal vents on land and under the deepest oceans. The anaerobes may have been some of the earliest life-forms. The rumen was the first of these habitats of anaerobic organisms to be investigated and remains the most comprehensively recorded system: investigations of other habitats have been based on rumen microbiological methods. At the time of the first edition, modern rumen microbiological investigations had been going on for some forty years, and while there had been reviews of aspects of the work covered by the hundreds of papers on the rumen, there had been only one comprehensive textbook on the rumen microbes, and this published twenty years before. It is now about ten years since the chapters for the previous edition were written, but the pace of microbiological research has generally quickened over the years, and over these last ten years the new ‘science’ of investigation of the relations between, and the reactions of, organisms by investigation of the structures and functions of their nucleic acids has developed rapidly, not only in general but also specifically with the rumen organisms. The rumen organisms, like those in most natural systems and in artificial systems such as sewage plants, live in mixed cultures, the component organisms having many actions and interactions. While the overall ‘plan’ of the rumen reactions has not been altered by the work of the last ten years, some points have been clarified and some detail added, partly by the advent of new, or improved, techniques of analysis. On the other hand, for instance, the taxonomy and nomenclature of the bacteria have been considerably altered. It thus seemed that the time had come to bring up to date the first edition of The Rumen Microbial Ecosystem.